Wednesday night I attended the 25th annual Rabbi Marshall T. Meyer Risk Taker Awards to celebrate the work of Jews for Racial and Economic Justice as well as the work of Opal Tometi, Patrisse Cullors and Alicia Garza, the founders of Black Lives Matter. As a Jew who in my 20s went from wrapping tefillin and praying daily to eating bacon religiously it was a profound experience to feel at home in a distinctly Jewish space. 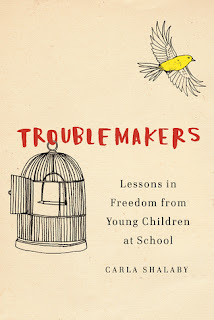 Even as I distanced myself from an observant lifestyle, the Jewish value of tikun olam, repairing the world, was the umbilical cord that kept me connected to my Jewish identity. Finding a Jewish organization which fights for a radical, progressive vision of tikun olam, felt in many ways like finding a future for myself in the Jewish community I had otherwise given up on. The question and the underlying tone played in my mind for the rest of the night, like dull radio static, threatening to drown out the inspiring words from the activists honored onstage that evening. As a white Ashkenazi Jew married to a Black woman raised Presbyterian, hoping to find a Jewish community that embraces my wife and our future children without qualification, this comment shook me. I doubt this woman would have been comfortable with someone asking “What about Christians?” in response to calls for diverse leadership in a multi-faith organization led by Christians. Nor would she have appreciated, “What about men?” in a conversation about feminism. American Jewish spaces have by and large centered whiteness for years, and continue to do so. Furthermore, with the exception of the founders of Black Lives Matter, all the award recipients Wednesday night were white Jews. It did not feel like white Jews were in danger of going unnoticed Wednesday, nor do I worry about white Jews getting “their due” in other Jewish spaces. As disheartening as the question “What about white Jews?” felt, it was also a necessary wake up call to reality. It was a reminder of the immensity of the work facing a Jewish community that often prides itself as allies and leaders in the civil rights struggle. 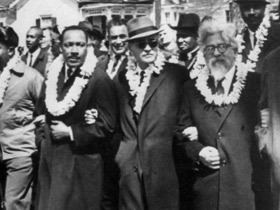 Rabbi Abraham Joshua Heschel marching with Dr. King. In 2015 many American Jews still use this 60-year-old image as proof of Jewish solidarity with the racial justice struggle. Organizations like JFREJ and Bend the Arc are doing important work on behalf of racial and economic justice in America. Doing their work as unabashedly Jewish organizations is helping to change the narrative that American Jews no longer care about these issues. Stosh Cotler, CEO of Bend the Arc, has spoken eloquently about the centrality of justice to the history and future of American Jewry. But clearly, there is a lot of work that remains to be done within the Jewish community as well. Too often, white Jews rely on our history of oppression in America and the wider world as a sort of pass from owning our privilege. This ignores the reality that in our recent history, whiteness was conferred on our community. And whether this transaction was intentional or not, we stand today benefiting fully from it. It feels like we want all the accolades and warm fuzzy feelings of allyship, but none of the discomfort of confronting our own privileged status. What about white Jews? What about white Jews of the 1960s who proclaimed their solidarity with the civil rights movement, but fled Brownsville and the Bronx when Black people moved in? What about white Jews who decry segregation in New York City schools in 2015, but refuse to send their children to school with Black and Latino children on the Upper West Side or in Brooklyn? What about white Jews who are willing to get arrested to protest the death of Eric Garner, but who aren’t willing to support a vision of a Jewish community where their experiences aren’t always the center of attention? What about white Jews who write think pieces on allyship, but don’t “call in” or call out friends, neighbors, colleagues and family members engaging in oppressive behavior when they see it? I love JFREJ and all the Jewish people who use their voices to protest police violence, support immigrant rights, demand a living wage for fast food workers, and generally fight for a more just and caring world. These are the members of my Jewish family who affirm the most resonant values of my Jewish identity. If we are expecting gold stars for this allyship though, it’s not allyship at all. Furthermore, it’s not in line with Jewish values either. The 12th century Jewish scholar Maimonides famously taught that tzedekah is more meaningful when it is given anonymously. It’s worth nothing that although tzedekah is generally translated as charity, it’s root is tzedek, which means justice. A vision of leadership that centers historically marginalized voices would represent a powerful transformation for JFREJ as a Jewish organization looking to model social change within and beyond the Jewish community. It’s a shift that’s needed across the spectrum of Jewish life. It is a vision that makes me feel more hopeful that my family can participate fully in Jewish life. I think it is a vision worth fighting for. It is a vision I hope my fellow white Jews will fight for. There should have been a collective response from the larger group of chiding this woman for making such a statement. Totally out of line!